Infinity. The word itself invokes a mind-numbing a sense of awe. The concept fills even the most ardent scientist’s imagination with images of parallel universes and time travel. Unfortunately, using a concept that is beyond comprehension such as infinity can quickly blur the lines dividing science and fantasy. I've often observed that the point at which our minds go numb with impossibility of comprehension, we’re simply enjoying the relaxation of our thoughts, thinking the experience to be some sort of enlightenment when in fact, we are giving up on the possibility of further knowledge. Before we can accept the concept of infinity as a natural occurance, we must first be able to observe and test it . Failing this, we must call into question its existence. 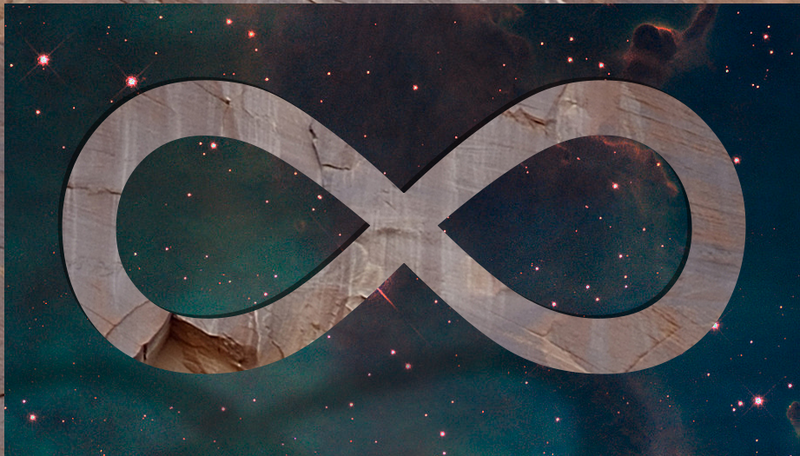 Questioning infinity isn't easy since it’s so ingrained into our lives. We all assume that things such as time and space simply go on forever. We should though, take time to ponder whether we’re assuming something that simply doesn't exist. I think that in the case of infinity, our minds are working from false assumptions and that infinity itself is not a feature within the physical world. There are basic realms where arguments exist which require the existence of a physical infinity. A thorough examination of each show no necessity for it, yet we rarely hear the concept of infinity called into question. With the following examination I propose that infinity does not exist outside of our conceptual toolkit of mathematics. Scientific discussions of physical Infinity generally occur in the areas of space, time, and mathematics. Although infinity within mathematics is an interesting conversation, we can dismiss it as purely conceptual so as not to cloud the discussion. I’ll spend some time on that subject in another article. For now, lets concentrate on the physical, time and space. Is space infinite? First, we have to define space. According to our minds, it’s what we look up into at night, the stuff that replaces milk in a carton, and the thing that separates you from others when we need some alone time. But space is not a “thing” at all. Our minds have evolved to process the idea of space in a way that’s efficient for our survival. As a mental shortcut, we use space as a filler for the conceptual potential of a geometrically defined area. Although technically we correctly define space as the absence of matter, in our daily lives we treat it as if it were a “thing” itself. If I were to dig a hole in the ground, we would all assume that it’s possible to measure the width of the hole, but we can’t. What we can measure is the distance between two edges of earth around the circumference of the hole along a ruler or measuring tape. In other words, without the reference of the earth surrounding the hole, there is no measurable hole. Likewise, our minds tell us that when we hold a ruler in the air, we are measuring a distance of space when in actuality, we are only measuring points along the ruler itself. The truth is, you cannot assign a value to space. Distance can only be measured between two points of matter. Volume can be measured only between four or more points (objects). The false assumptions formed by these mental shortcuts lead us to conceptualize space as a vast “thing” which holds all objects, also inferring that i has a measurable mass. In fact though, space is merely a property of the objects and does not exist without them. Not to deny that space exists, just that space doesn't have its own physical properties such as length or volume. 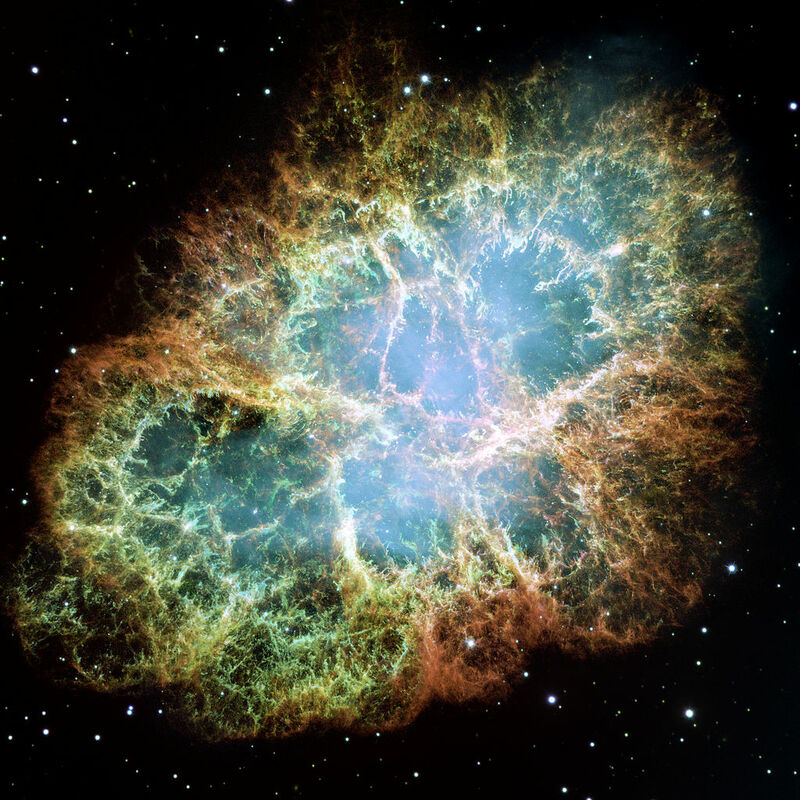 Space exists only as a relative property of matter, not as an entity on its own. Therefore, not only is there no space beyond the furthest matter, there is also no physical "beyond" at all. Once we understand that space itself is not an independent component of the universe, we eliminate the variable causing confusion by it being both measurable and immeasurable, thus removing the logical necessity for infinite space. The distance across our universe can now be equal to the furthest two objects within it. The logic also applies across multiple universes. The expanse of all forms of matter and energy is surely an incomprehensible distance, but finite none the less. Within the context of our reason, time is a tool for measuring events in relation to a series of seemingly constant repeating events. A season is comparable to 91.31 rotations of the Earth. The length of my meeting this morning was defined by 57,600,000 oscillations of a specifically designed quartz crystal controlling a clock on the wall. Time is nothing more than a group of physical motions that we define as an event compared to a more predictable series of motions. Knowing this, we can assert that time is simply a mathematical equation of relative motion. Both time (a measure of movement) and space seem to be properties of matter when compared to other instances of matter. 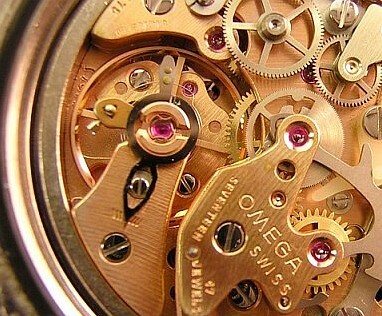 Time though, is not a physical concept, just a mathematical one, and should be replaced with motion when conceptualizing the mechanics of physics. The question of whether time is infinite then becomes a question of whether movement is infinite. 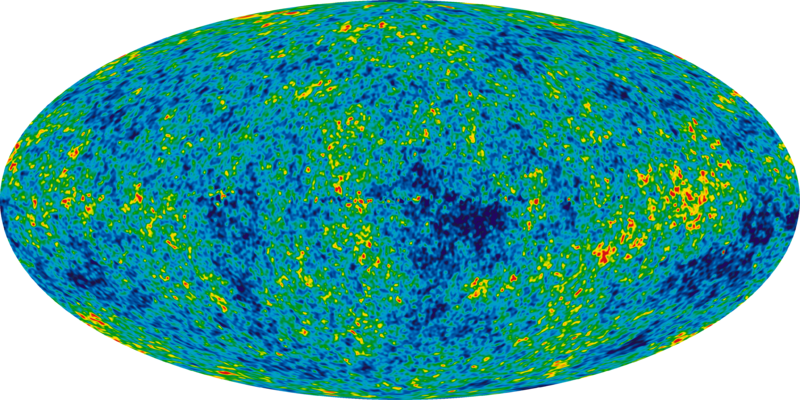 Currently accepted theory states that movement in our universe had a beginning and thus should also have an end. I don’t like the idea that motion (time) will end. It makes me uncomfortable. Nature didn't design us to deal with thoughts such as these. Honest reasoning though, tells us that the lives we have and all that we know will eventually end. Moving on from that cheery thought though, How? How could time, or more accurately, how could motion end? The law of conservation of energy states that energy cannot be created or destroyed. It can only be changed from one form to another. The key lies in statement that energy can be changed from one form to another when applied to the conceptual laws of infinity. The concept of infinite time requires that any possible configuration of the universe will eventually occur an infinite number of times. But one possible configuration would be the conversion of all kinetic (motion) energy to potential (stored) energy. Without motion, all further possibilities end, and the concept of infinity is broken. This is the point at which time ends. Edit 11-09-2016: Okay, the Universe may NOT be spinning. It's been a couple years since I've written this article and along with some great supportive models and theory, I have come across similar (but much more knowledgeable) discussion that shows this theory unlikely within the context of our current understanding of the universe's structure. As always though, I'm proud of my thoughts and misconceptions. They are drivers for my education and thus so, are left intact below. Note: During my study, I also found that the idea of a collapsing universe was not necessary for gravitational acceleration towards a rotating circumference. Dark energy may simply be centrifugal and centripetal forces inherent to a spinning universe. Dark energy is an unknown force used to explain the accelerating expansion of our observable Universe. It is my humble opinion that this energy is created by the conservation of angular momentum of a collapsing universe. Picture a figure skater starting a spin. Her arms are outstretched and her rotation is fairly slow. As she pulls in her arms and legs, she increases her rotation speed. She spins faster because she has reduced her rotational inertia. This model assumes that the outer mass of the Universe has succumbed to centripetal forces and is collapsing back towards the center. And like the arms of the figure skater, the collapse reduces rotational inertia causing accelerated centrifugal force here within the area of the universe we can observe. Unlike the more rigid structure of the figure skater though, our more fluid inner portions of the inner universe allow expansion at an accelerated rate that is relative to the outer universe's collapse. This theory seems to account for what appears to be an accelerated expansion rate from our limited view. I also like that it seems to be more in keeping with conventional physics. So to recap, the basic premise is that the expansion of the Universe is heterogeneous, the collapsing outer portions of our universe reduce rotational inertia, thus increasing total rotation speed and expansion of the inner Universe by centrifugal force. But why would we think the Universe is rotating in the first place? Well the real question is, why would we not? For the Universe not to spin, all components of its expansion would have had to exert force exactly directional to an infinitely small point throughout its expansion. That point would have also had to have absolutely no previous rotation. Given those two unlikely conditions, I think it's safer to assume assume rotation exists than to assume it doesn't. Back in May of 2011, Micheal Longo and his team published Detection of a dipole in the handedness of spiral galaxies with redshifts which asserts that the Universe has a preferred axis upon which it spins. His research showed an excess of left-handed spiral galaxies toward the north Galactic pole and an excess of right-handed in the opposite direction which suggests dissipation of angular momentum among the galaxies during expansion. I'll be reading others' related research and looking for more information about conservation of angular motion in fluid environments. Let me know if there are sources I should check out. Please pass this article on to interested parties. All comments and criticism is greatly appreciated. 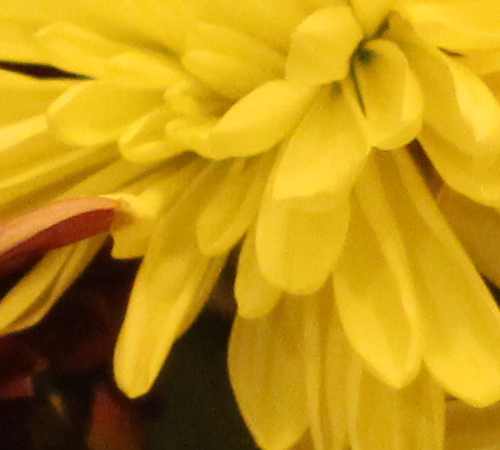 One of the cool things about the new mirrorless cameras is their shallow focal depth. With an adapter you can attach just about any lens. Of course most old lenses have to be focused manually, but if that's not a problem for you there's tons of old glass practically being given away. Canon fixed their slow EOS M autofocus problem which initially drove the price into the ground so I had been planning on getting my hands on one. Luckily, my beautiful and generous wife bought me one for our Anivistmas (Anniversary/Christmas). There are plenty of reviews on this camera so I'm just going to talk about the lenses here. I went a little crazy on eBay and have about eight cheap lenses on the way. Today I got my first adapter and lens in the mail. The adapter is for the old Canon FD/FL film lenses and my first lens is a 50mm 1/1.8 which was listed on eBay as damaged because a Hoya Skylight filter was stuck on the front. Final price, 99 cents. 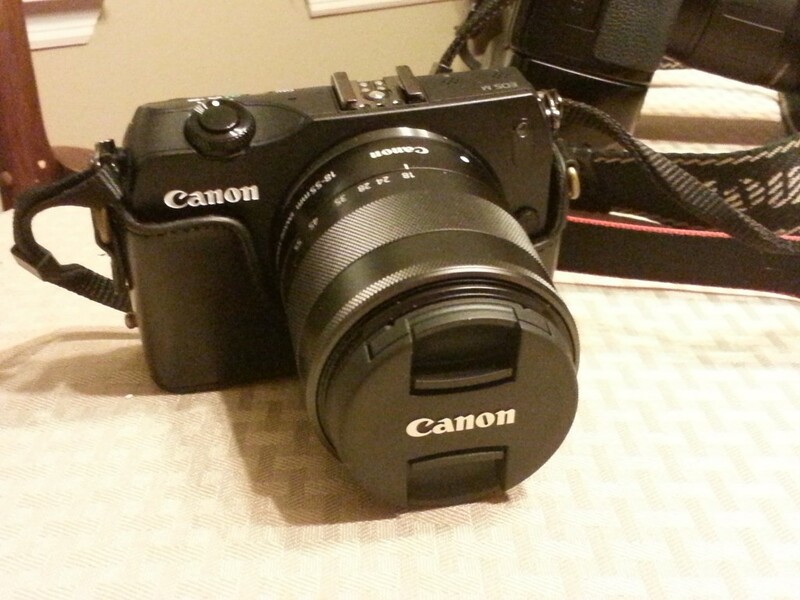 My EOS M came with a nice 18-55mm 1:35-56 image stabilizer lens that's a good all-purpose and great video lens. I'm comparing it to the eBay lens to show how cheap and easy a specialized lens can be had for this camera. My thought was that the old lens would be good for low light imaging and I was right. Here's the stock 18-55mm lens that came with the camera. It's a great lens with image stabilization. Indoor shots at night like the one below come out grainy without a flash. The EOS M has a hot shoe but I just really don't like the shadows and flatness you get from a flash. 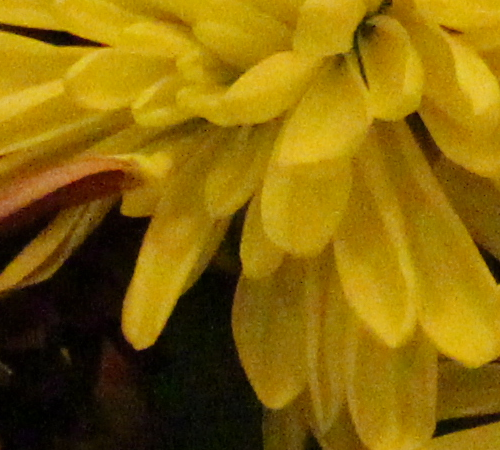 Here's a cropped section from stock 18-55mm lens. The full image was actually pretty good considering the amount of light that was available. 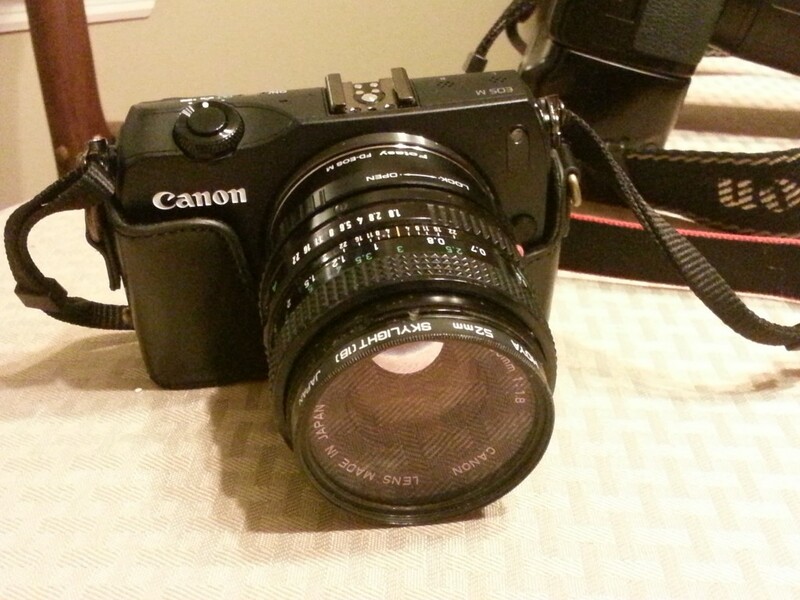 Here's the $1 Canon FD 50mm 1:1.8 lens purchased on eBay. I think it gives the camera a cool retro look. As you can see in the image below, this lens lets in much more light. If you don&#39;t mind spending a little extra you can get autofocus from an EF 1.8 lens and have the light advantage too. Also, something to keep in mind is the conversion factor when you buy a film lens. With the 1.6 sensor conversion, this 50mm acts like an 80mm so plan on the extra built-in zoom. You can tell that the sensor has much more light to work with when the old 1:1.8 lens is used. So far I've ordered five lenses for around a dollar each before shipping costs. The most I've paid is $20 for a digital EF lens. Like I've said, there are lots of reviews to help you decide whether this camera is good for you. I wanted the camera because it's a good fit for me. It's small enough that I can hike with it and attach it to a telescope without throwing the weight off. That said, I recommend it mostly because it's fun. Right now the EOS M price is down to around $350 with a lens or $250 without. Not bad for what is basically a smaller mirrorless Rebel t4i. The reviews and articles I've read on the new Ouya game console seem to be missing an important idea behind the product. It's not really a competitor to Microsoft of Sony. They're different animals altogether. While an XBox is purely a mechanism for the delivery of games, the Ouya is much less of a consumer product. Sure, it connects to your television so that you can play games using controllers, but that's where the similarity ends. 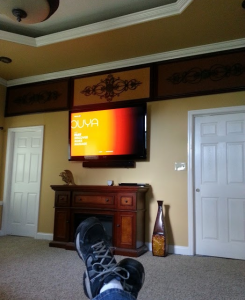 What Ouya is really selling, in my opinion anyway, is openness. Think about it, what is the last major electronic product you can remember that was designed to be hacked? To be taken apart, rooted, and used in a manner contrary to how it was advertised, without voiding its warranty!? Not only can you change its operating system, but you can write your own apps or games. A software developer kit comes pre-loaded onto the console for free. Comparing the Ouya to other consoles is like comparing an arduino to a toy robot. The robot is shiny and refined. It does exactly what it is designed to do. The arduino, on the other hand, doesn't do much out of the box, but can be programmed to do whatever your imagination and curiosity design it to do. I've been playing with my pre-release backer version of the console for about a week now and I can't wait for it to go public so people will start posting hacks and attachments. In the picture above, I'm sitting across my bedroom about 20 feet from the console. The wireless controllers work well. So far, the most frustrating part of my experience has been figuring out how to leave a game. Most of the games available seemed to have been designed for Android tablets and my controller doesn't have a home or back button. If you're the type who likes to take apart your toys, or especially if you have children who need an outlet for their curiosity, I highly recommend getting your hands on a Ouya console! Sometimes looking at things from another viewpoint can give us a better understanding of a complex topic. As is often the case when humans are part of the discussion though, it's hard to keep our own egos out of thoughts on evolution. Once we thought that the earth was the center of our universe. Now many still think that humans are the pinnacle or the "purpose" of evolution. For example, when single-cell organisms began to evolve into multi-celled organisms, we classify the groups of cells as a new organism when they are actually a group of cells living in a symbiotic relationship. We don't know what type of symbiosis these first successful groups of cells had but I think it's safe to say that they enjoyed some sort of evolutionary advantage. The new organism classification is entirely understandable though. Our natural curiosity is based on the evolution of animals like us, not on the individual cells within colonies. If you really think about it though, we actually are a community of individual cells who depend on one another for survival, biologically defined as an obligate symbiosis of persistent mutualism. You're probably thinking that this argument is more about semantics than about anything useful within evolutionary biology. And you're right. It's only when you step back and look at the progression of symbiotic colonies that the idea becomes interesting. If cells relying on each other can be though of as evolution of the first symbiotic colonies then organisms relying on each other could be thought of as the second. 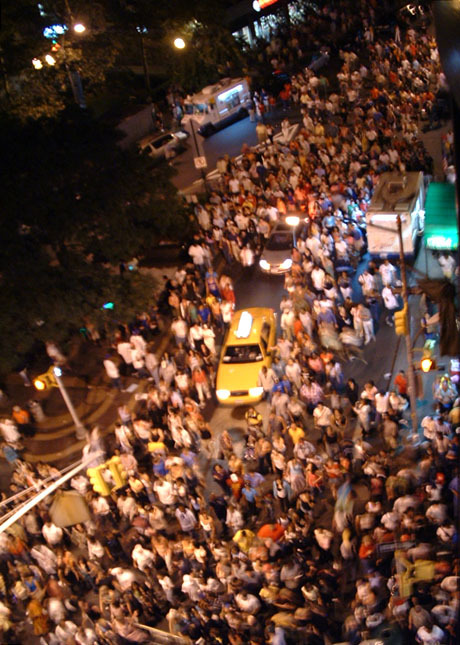 Are you thinking that humans have made the leap to the second evolutionary colony? If so, it's time to check that ego again! We are not as individuals naturally designed for specific purposes within our communities. While we may find ourselves better suited for certain community tasks, our communities themselves are not biologically replicated. Measured by colonial evolution, many insects are much more evolved than us. 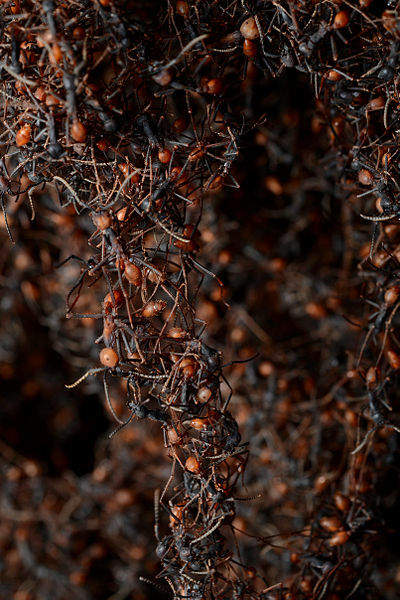 An Ant, for instance, is both a colony of symbiotic cells itself and a member of a biologically replicated symbiotic colony. All derived from the same cellular DNA. I would like to note that I'm only talking about single-lineage symbiotic communities, not inter-species symbiotic relationships. Although humans will most likely never reach second colony status, as social animals, we're in what I would imagine be the early stages of that evolution. Our first 23 chromosome pair ancestors were probably siblings with a chromosomal deformity born of an ancestral type of ape. If future science holds true that the siblings started a weaker lineage of naturally selected animals, maybe they needed to rely on each other more for survival than their 24 chromosome ancestors. This could mean that evolutionary weakness could be a driver for socialization and later colonization. Now let's apply this logic to our further distant single-cell ancestors. Could it be that the evolutionary driver for colonization were single cells that were poorly equipped to make it on their own? Personally I like the idea of the underdogs coming together. I also like the idea that we can depend on one another to make each of our lives better. But maybe that's just my evolution talking. This is a great project to help kids grasp the scale of our Solar System. Images like the one to the right can show the difference in planet size but they distort the distance between planets in our Solar System. There's really no way for kids to understand the scale on paper. If you were to print an image of our Solar System to scale, the planets would be invisible. What students need is something more tactile, a way to physically experience and grasp the actual scale. To accomplish this, you'll need to stretch things out. So how do you get your kids out of their desks and venturing through the cosmos? First, you'll need a good long nature trail or walking path to do it safely. I prefer asphalt because it looks more like the darkness of space. When you have chosen your canvas, you'll need to print your planets to scale depending on the distance you have to work with. Starting with the size of your sun, use the chart below to plan your Solar System Walk. You'll probably want to use chalk to draw your Sun since it's so large in relation to the planets. Planets can be printed out and taped to the pathway, or you can simply use sidewalk chalk to draw them too. How far do you need? Well that depends on whether you want your planets to look like planets or pinpoint dots. For a better visual impact, I would work with a scale that gives you an earth that is .3" to .5" across and a Jupiter that is around 5" across. This gives you a Complete Solar System laid out to scale in about 2.5 miles. For a more practical length I would suggest stopping at Saturn to keep your walk at about a mile total length. A little longer than you had thought, right? That's the idea here, even us well-educated adults fail to have a real sense of scale when it comes to the Solar System in which we live. So get on your walking shoes and enjoy your learning experience while walking on the surface of planet number 3! Type in the size of your Sun and calculate. A large hurdle for mainstream adoption of renewable energy is the problem of power storage. How do you keep electricity flowing when the sun goes down or the wind stops blowing? The common solution, batteries, is expensive both in initial costs and maintenance. In large scale power generation this simply isn’t a feasible option, demoting green energy to the status of part-time provider. Being sort of a mechanics geek, I've often wondered why I never see a means of mechanical power storage and release as an alternative to batteries. Let’s look at a solar farm for example. To me, the massive collector tower at the center of this solar farm is just begging for a gravity-fed mechanical solution. 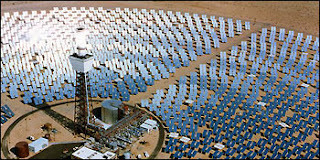 This particular demonstration plant called Solar Two near Barstow, California, was decommissioned in 1999. Newer plants mostly use trough systems which do away with towers but similar solutions could be adapted for use there also. 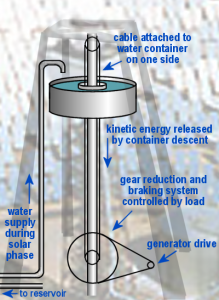 In the very much simplified example to the left, water is supplied to a collection tank by a pump and/or steam condensation during the solar collection phase. When sunlight is no longer available the container is released so that it slowly descends with the aid of a highly reduced gear/cable mechanism and drives a generator to produce power through the night. When the sun rises, the generator is switched back to the steam powered turbines, water is released back to the reservoir, the empty container raised, then the process repeats. As I said, this would be a greatly simplified explanation of the actual implementation of such a system but I believe the general concept to be sound. Mechanical energy storage is often dismissed as low-tech or antiquated technology. That may be true. This doesn’t mean that it doesn’t have useful applications. The energy lost between electrical to mechanical conversion is almost always greater than in mechanical to mechanical. And no matter how ingenious or innovative your energy source, turning a generator is always a mechanical process. If you know of anyone who may be interested, please pass this on. I would love to get feedback or criticism on my thoughts. Also, feel free to contact me through Google+ if you would like a more detailed description of the mechanics or alternate configurations. All original ideas expressed within this article are to be considered public domain prior art, and not available for use in patent applications. Desk Cut-out. Why aren't all desks made this way?